This mortat mixing plant is located just to the north of the former bridge that carried the Ashchurch to Malvern Railway over the River Severn near Ripple. It is served by a fleet of barges operating to a wharf on the river. The wharf opened in 2004. The easiest viewpoint is on the opposite side of the river and can be accessed by following the Upton upon Severn walk on this site. The operator is Cemex Ltd.
Three of the four 180 tonne motor hopper barges in use on the river traffic can be seen moored at the wharf. These are operated by Thomson River Transport Ltd and are named 'Perch', 'Chub' and 'Pike'. The fourth barge is named 'Elver' (a name for a young Eel). The barges bring sand and gravel from Ripple Quarry, about two miles to the south, for processing at Ryall. The stone and gravel from the barges is moved, by the road crane on the right of the picture, onto the conveyor belt for transportation though the white tunnel to the processing plant. In days of old it is easy to envisage the use of a narrow gauge railway to connect the wharf to the processing plant. 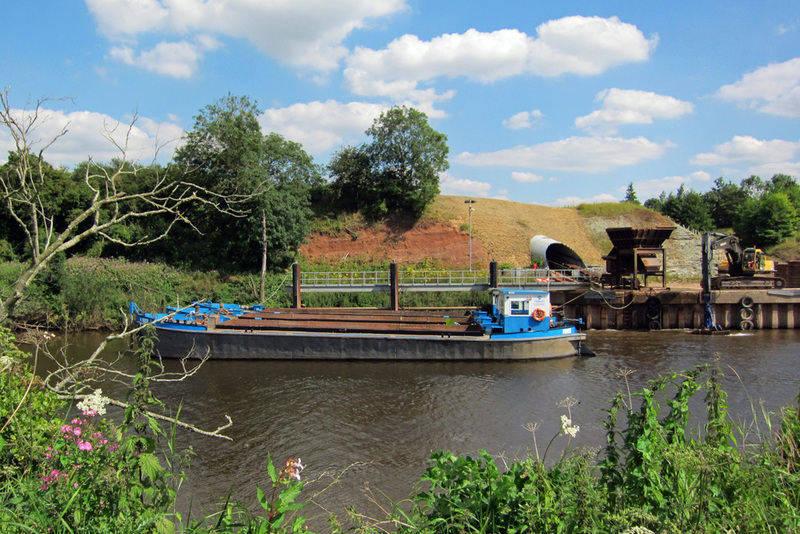 The transport of stone and gravel by barge from Ripple to Ryall represents a welcome return of the commercial use of the river after an absence of 40 years. As at 2012 it represented the only such operation in the county. REF: www.cemex.co.uk/su/pdf/RiverSevern.pdf ( Cemex press release). REF: www.torbayseaways.co.uk/20.htmll (Thomson River Transport Web Site).